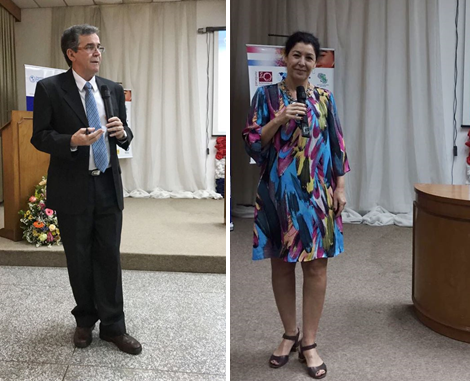 To celebrate BIREME’s 50th anniversary, Paraguay held the II Foro Nacional de la Biblioteca Virtual en Salud (BVS), an event that took place in the facilities of the Instituto Nacional de Salud, in Asuncion. Among the participants, Dr. Luis Roberto Escoto, PAHO/WHO Representative in Paraguay, Dr. Diego González Machín, BIREME Director, Verônica Abdala, Manager of Services and Sources of Information at BIREME, and Dr. Angilberto Paredes, Director of the Instituto Nacional de Salud (INS), in addition to other special guests and cooperating members of the Red Nacional de Documentación e Información en Ciencias de la Salud (REDISAL). Finally, Dr. Escoto closed by encouraging the participants to reach the objective proposed of generating room for debate, dialogue, and exchange of ideas about the current and future situation of Paraguay VHL. In her turn, Verônica Abdala presented an analysis of collaboration and participation of Paraguay in the information products and services developed by BIREME, particularly the VHL and LILACS. She drew attention to the importance of expanding Paraguay participation on bibliographic control of its production, which substantially contributes for visibility, access to and use of updated and relevant inormation, contextualized to the health needs and priorities in the country. In this sense, it is paramount to develop capacities in the Network and foster collaboration, as well as providing infrastructure and human resources to health libraries, which were the main weaknesses detected according to a recent study developed by the INS, which also coordinates REDISAL and VHL Paraguay. Implementing quality management programs in all different VHL processes. After the event and to close his mission in Paraguay, Dr. Gonzalez met with PAHO/WHO Paraguay technical staff to present the Center the main strengths, products and services, and to talk about the importance of channeling all actions performed in the country in full coordination with PAHO/WHO office. In addition to boosting actions, this will help developing joint projects and strengthen the scientific-technical information component in the scope of the country’s Cooperation Strategy.